I stayed up til 7am hoping to hear Thanet South declare – the only Tory victory of the campaign that I’m delighted with. 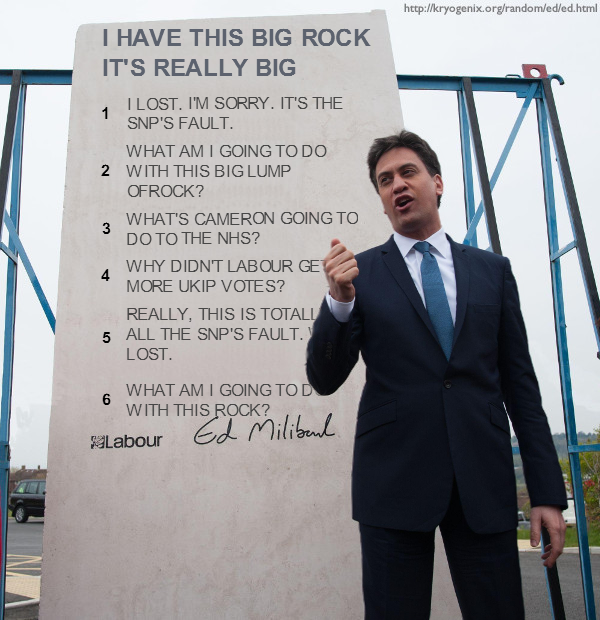 I wonder what Ed Miliband will do with his big lump of stone now? It’s not funny. This is a horrific result. And it’s Labour who lost it. This is a re-run of 1992 – and in 1997 the New Labour won a majority and gave us Tony Blair and the Iraq war. Who will “reform” Labour after Ed Miliband? Even now not quite all the results are in. But enough to be able to see the picture for the next five years. Six constituencies yet to declare. So, Iain Duncan Smith will get to continue with his sanctions and bullying and lies at the Department of Work and Pensions. George Osborne will get to make his twelve billion cuts to welfare. David Cameron will announce a referendum on EU membership. There will be no taxing the rich, no ending the non-dom tax loophole, Rupert Murdoch will continue to own swathes of UK media, and people will die of hunger and neglect: because that’s what the Tories do. We have no hope of ousting them until May 2020, and perhaps not even then. What are you staying up for? If the DUP get 10 seats, as some polls predicted, the Conservatives would be able to choose between a coalition with the LibDems or a coalition with DUP, whichever they pleased: either would get them to 326, and if so, we are screwed. 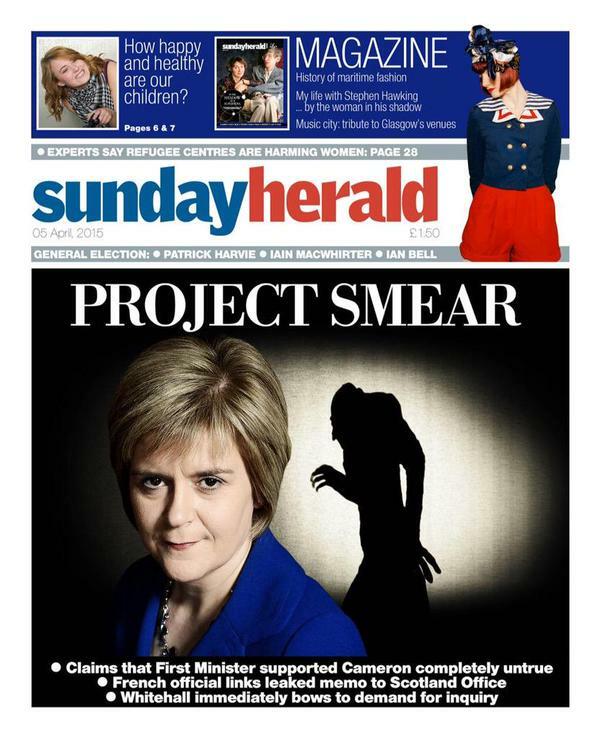 The memo attack on Nicola Sturgeon, a day after she had been lauded at the leaders’ debates, was certainly an attempt by the Daily Telegraph to discredit her. If the Telegraph employees who contacted Labour and the LibDems for comment were subtle enough, it was also an attempt to discredit those two parties. The Head of Content (as Peter Oborne noted, the Telegraph no longer has an editor) may have been instructed by David and Frederick Barclay to win the general election for the Conservatives: and it is a matter of simple Parliamentary arithmetic to see that if the polls hold good, providing Labour and the SNP are willing to vote together against the Tories, the Tories cannot form a government.